If you hang out with me on Instagram, you know that I'm pretending it's spring. Even though today is a snow day and the kids are home from school. Shhh... I mention this because a spring breakfast calls for something different from a winter breakfast. 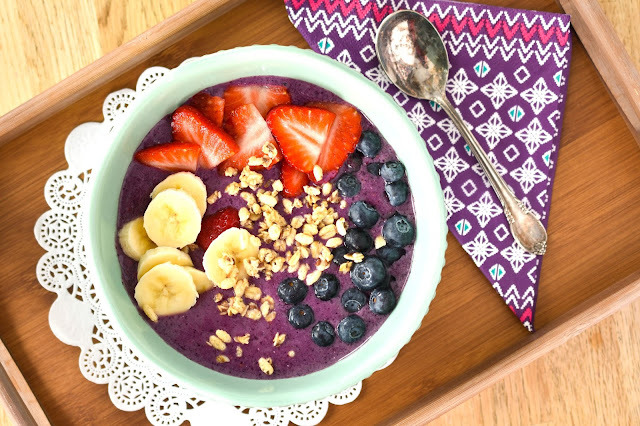 Like a smoothie bowl. (Which is not to say I've given up on oatmeal.) This particular smoothie bowl is made from frozen mixed berries, a fresh banana, soy milk, ground flax and peanut butter. Of course, the toppings are the best part. On this day, my smoothie bowl toppings were banana slices, strawberries, blueberries and granola. To prepare the perogies, I boiled them for a couple of minutes. In the meantime, I fried a diced onion in a mixture of olive oil and vegan margarine. I added fresh broccoli, mixed frozen veggies and baby spinach and sauteed everything until the broccoli was tender. I then scooped up the perogies and added them to the pan to brown them some. 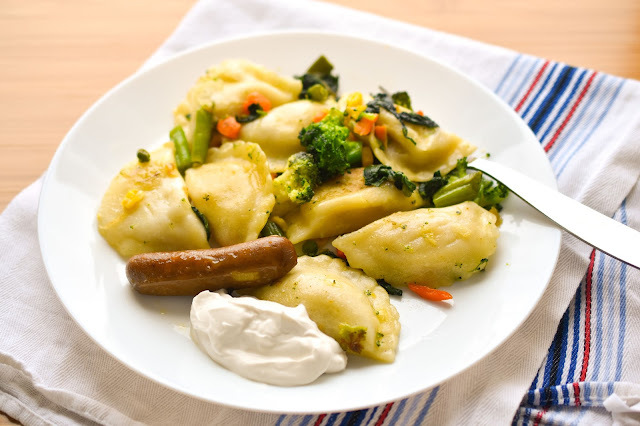 I served the perogies with store-bought vegan sour cream. Oh, and that's the one lonely leftover vegan sausage from dinner too. I forgot to take a photo of my mid-afternoon snack, so I thought I'd show you a few of the things I've been snacking on this week. 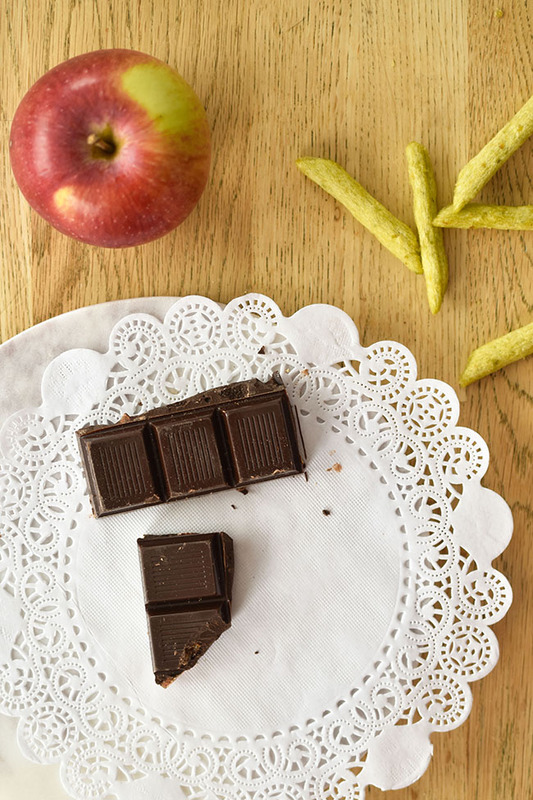 Like apples, dark chocolate with fruit and Harvest Snaps Snapea green pea crisps. 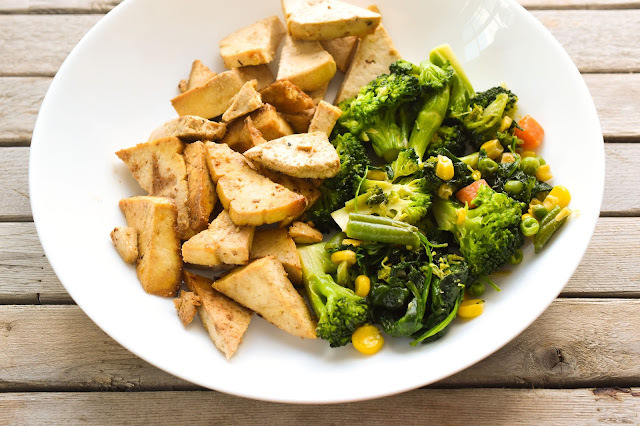 I enjoyed the broccoli/spinach/frozen mixed veggies saute that I had with the perogies so much that I made it again with this easy baked tofu for dinner. This is a super simple meal to make. The tofu is quick to whip together and you can prepare the veggies while the tofu bakes (with another 10 minutes to just sit and enjoy a glass of wine). What about you? Are you eating warming winter foods, light spring foods or a combination?